I’d hate to shoot large rifle calibers out of there. I bet now they could make such an awesome flying platform, seeing as computer control could easily stabilize it. Talk about exposing yourself to incoming fire though haha. Basically it would be an awesome toy. John Ringo (very good SF writer) had a series Legacy of the Aldenata/Posleen War series of books. At the beginning he had the god kings (in charge of the normal troops (about eight year old mentality)) riding around on anti-gravity sleds. The god kings found out quickly they had a tendency to attract the eye, and fire. Life expectancy was on the lines of opening up with an M-50 at night. Not a chance I’d want to be near one in combat. I was wondering ;is it possible to use two Electric motors and while the motors are draining the batteries,It is charged by Solar power at the same time?then it can go long distance,The best thing about powering it with Electric -Motor? is becuz it is Silent,another benefit for this kind of transport-mode,is for the out-doors mem and women ;who are interested in Hunting and exploring, or plain hunting wild animals , and Crocodiles in the Ever Glades, in Florida,cuz the animal cannot reach the hunters in their flying plat form,flying above fifteen feet,or twenty feet,an egg shape plexi-glass can be installed ,above the pilots head,to protect the pilot from wind & rain,and another safety idea? is to put Flotation gears around the flying plat form so that it can land on water,in case ,of Engine Failure! !with the egg-shape copula in the shape of a cone? I,d rename this Flying plat form ?The Flying Egg. what with the advancements in drone technology, putting a person on it instead of just a gun and camera would be absurd. FPS Russia had a drone with a gun. Although that video is pretty bad, I thought suppressed weapons weren’t that quiet, or why they would be sniping people with a Barret, or having to cycle the action manually on one. Or why someone would take cover behind a bunch of gas cylinders. I stopped watching after that. The FPS Russia video also showed a CGI drone. You got to feel sorry for the soldier who got “volunteered” to go up in that thing. That could be a whole lot of fun! Bad for combat though! From what I hear this thing was too stable for regular use, it just went up and down and it took a very skilled pilot to move this thing around in the air. With modern computer technology one might be able to create a more effective version. And I think someone tried with a vehicle called the springtail. 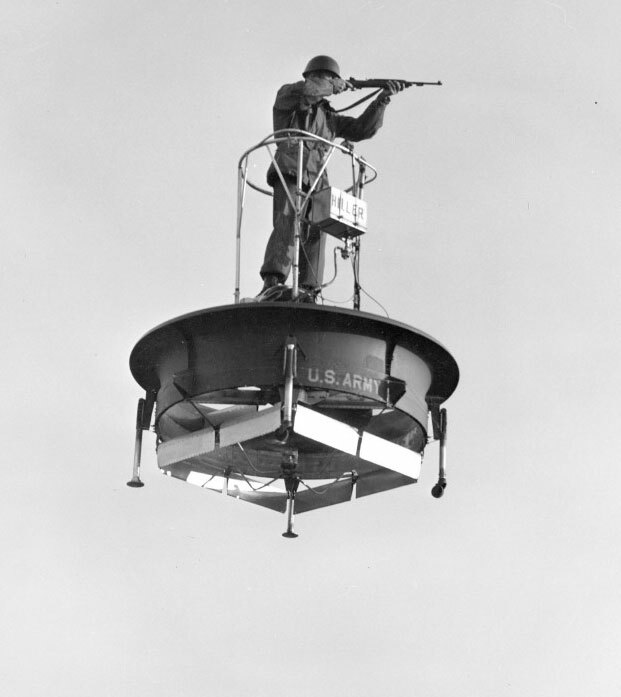 But this sort of thing would be useless in combat, just a big noisy target. Metal Gear Solid 3 had the Soviet equivalent of these driven by enemies, called “vtol platforms”. Seemingly they were powered by a jet engine of some sort and the pilots carried Skorpion submachine guns, pretty fun to fight. A radio conversation with your character’s weapons/gadget support guy even mentions the American version.